Buddhists, Christians and Taoists unite? Imagine that. This week I am in Taiwan attending the 8th Annual International Youth Conference which is themed “Reading + Action = Change the World”. It is hosted by my friend, Lewis Lu, a mild-mannered Librarian who once said, “It’s not okay with me that Swazi children are suffering and I am going to do something about it!” And that is exactly what he has done, without ceasing. Lewis is the founder and creator of the International Youth Conference and is now leveraging an already brilliant idea to build awareness in Taiwan for the challenges of Swazi children. Each July Lewis brings students from Changhua Senior High School to serve in Swaziland. They volunteer at Project Canaan and visit other schools and people helping children. Lewis is the fundraiser for the Youth Conference as well as for the students to travel to Swaziland and now he is a fundraiser for WATER in Swaziland – he calls it “Walk for Water”. 2013 marks the third year of the “Walk for Water” campaign, which has seen students from Taiwan, Japan, Swaziland, Canada and the US walk 100+ kilometers to raise awareness and funds. Funds raised in 2011 and 2012 allowed the team at Project Canaan to start clearing the land where Dam #3 will be located. Mike Skiles has worked tirelessly with the bulldozer to clear many acres of treacherous hills and valleys. We were also able to complete an environmental study and have plans being drawn up. This year Lewis led the team of students and teachers to Wusanto Reservoir, designed by Japanese Architect, Yoichi Hatta, after World War II. This famous and beautiful Water Reservoir has allowed for extensive agricultural development and production in the Southern part of Taiwan. As the team gathered with dignitaries, including Ambassador Gwebu from the Kingdom of Swaziland, and the media, we all were overwhelmed by the notion that this “foreigner” (Hatta) gave his life to help the people of Taiwan because he could, and it was the right thing to do. Representing the US were students Alex Lehman from Colorado and Calvin McCarthy from Tennessee. 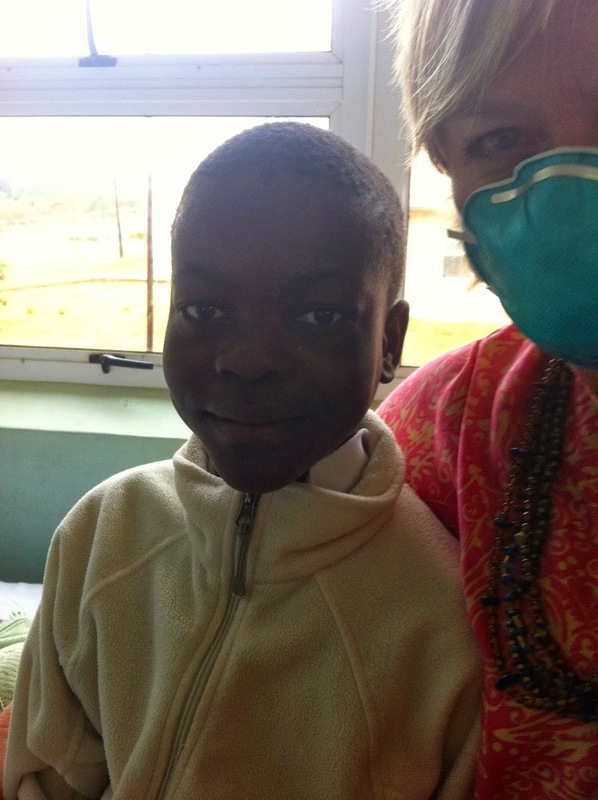 Both students have traveled to Swaziland and served with Heart for Africa at Project Canaan. They represented their country, their families and Heart for Africa well and I was proud to stand with them as we celebrated what Lewis Lu is so committed to – changing the world, one student at a time. Last week before I left Swaziland we were honored to have the new Ambassador from Taiwan to Swaziland to visit us at Project Canaan. We discovered that Ambassador Thomas Chen just “happens” to be a 1972 graduate of Changhua Senior High School – only GOD could have planned that one! He was happy to visit the farm and to see where the new dam will go. We look forward to continued relationship with the Taiwanese Embassy in Swaziland. Today is Saturday and I am back in Taichung to see Chloe for the weekend. Ian surprised us with a night in a hotel downtown and we are heading out to the Taichung Jazz Festival. What a surprise blessing after an amazing week. On Monday I head back to Taipei to speak at the Taipei Medical University and then the rest of the week will play out as HE sees fit. I continue to stand in awe at how God brings people together in just the right time and the right place for His purposes. This week Buddhists, Christians, Taoists (and I am sure a few others) united together to learn from each other, share our experiences and take action to help those less fortunate. It was a beautiful to see and I am thankful to have been a part of it. Live from Taiwan ... it's Saturday night! Today we buried Baby Solomon. This week Solomon died. He died from complications as a result of Stage 4 AIDS, which included liver and kidney failure, bi-lateral pneumonia, lactic acidation and a myriad of other things that I can’t begin to understand. He was on a ventilator, had blood coming out of his nose and mouth from his lungs which were bleeding internally and he was cold due to poor blood circulation. He did not die a painless death, but he is now pain free. 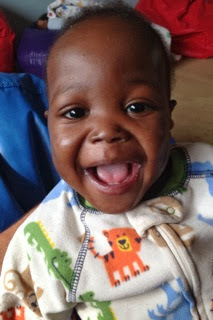 Last Tuesday a little baby died who was to come and live at the El Roi Baby Home (see last week’s blog). I had the sad experience of watching a Grandmother scrounge around a carpenters shop looking for scrap pieces of wood for him to make a very inexpensive coffin. Last week was like a Shakespearean foreshadowing that we read about in literature class. I would never have known that only a week later I would be saying goodbye to one of our own babies and looking for a coffin for him. 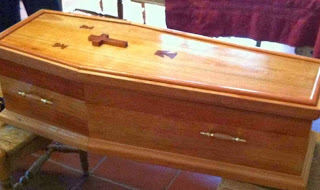 Last week we were able to provide $35 to the Grandmother to buy a decent coffin. This week Mark Klee literally cut the back off a beautiful bookshelf that he had just hand-made for his wife Jamie and used it to make the most beautiful coffin that one could hope for. Why? Because it was just the right size, and he could always make Jamie a new bookshelf. This was more important. Solomon was almost 17-months old and weighed 18 pounds. He only recently got his first teeth. He never crawled, never walked and was just starting to sit on his own. He was severely malnourished and AIDS was ravishing his tiny body. But he had the smile of an angel. Solomon was living at the El Roi Baby Home under our care because he was sickly and his mother was unable to care for him and begged the hospital for assistance. Our hope and goal was that once he was stable and strong that he would be able to go back and live with his mother and brother, so Tibuyile moved to the Sicalo Lesisha Kibbutz at the beginning of this month and has been working as a Khutsala Artisan. This is a very unique situation and the only one of its kind at El Roi. Typically we only accept abandoned babies, but we were trying to keep Solomon from being abandoned, while helping to stabilize the family. Death and funerals are complicated here. It seems that no one cares when a child is sick and dying, but everyone has an opinion as to what should happen once the child is dead. (I could pull out a giant soap-box here, but out of respect for Solomon and his beautiful mother Tibuyile, I will reserve that rant for another day). It was Tibuyile’s wish to have Solomon buried on Project Canaan, after many tears, conversations, prayers, meetings with the Chief, police and Social Welfare it was agreed that we could honor her request. She was not welcomed at her home to bury the child and Solomon’s father’s family wanted nothing to do with him. So we welcomed the opportunity to give him a resting place where his mother could visit. 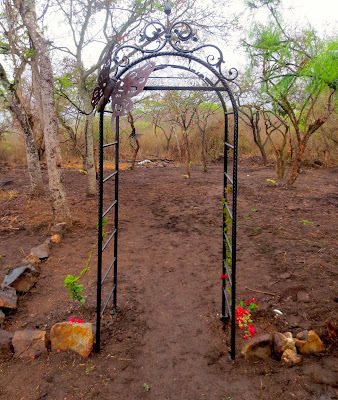 Denis and his team cleared an area in the trees right next to the chapel and it is now called “Emathune aSolomon” or in English “Solomon’s Cemetery”. We knew that the day would come that we would have a funeral on the farm, but hoped that it would be many years from now. Now we have a place, and I plan to be buried in Solomon’s Cemetery when that day comes. Some of our long-term volunteers gave funds for beautiful pink bougainvillea’s vines that were planted on Saturday and we found some whimsical butterflies to bring warmth to the trees. Tibuyile’s pastor came from town and resided over the ceremony. The small body was picked up from town at 5AM and brought out to the chapel. We were told that they would open the coffin for all to see the baby, but for some reason they didn’t do that today. I will say that they don’t embalm bodies here, and he passed away early Thursday morning. We did have to pay an extra $15 to have his little body washed. After the praying and singing was finished the pastor lead us all to the burial ground. The tiny coffin was placed down in to a deep hole and laid on a grass mat made by a woman from the Project Canaan community. Two men jumped down in to the hole and the coffin was passed down in to them. After placing a grass mat over the top, and putting some of Solomon’s clothing in with him, they started to shovel the dirt in on top. They held a shovel full of dirt for Tibyule so that she could throw a handful on top of the coffin and then the men took turns shoveling the dirt to fill the grave. After a few feet of dirt someone would jump back in and pack it down by foot. In the end stones were laid on top and Solomon was laid to rest. Death is such a big part of life, but for some reason death seems raw and “in your face” here. Tibuyile buried another child, about the same age as Solomon, only a couple of years ago. Similar illness, similar death, but back then she didn’t have a job or supporting family so her baby was held up in the morgue for 30 days while she begged and scraped for enough money to pay for the death certificate, the washing, the coffin and the public graveyard because there was conflict in the family and they didn’t want the baby buried at her home. This time was different. The pain of losing a child still rips at the heart of a mother and the memory of the child will never leave her mind, but today, she stood with her new family, her new friends and I believe she saw Jesus in a very new way. I am now heading to the airport to fly to Taiwan. I will see Chloe on Monday and Skype Spencer with high-speed internet. I can’t wait to see my children and hold at least one of them. I am thankful for their health and their lives. It is hard to live with a foot in two different worlds (1st world and 3rd world), but I pray daily that He will continue to guide me and strengthen me so that I can continue to serve Him, even on the darkest of days. Live from Swaziland … Dance Solomon dance! First there were 3 babies, and then there were none. On October 5th, 1991 Ian and I got married so I would like to start this blog by saying, “HAPPY 22nd ANNIVERSARY” to my wonderful husband, life partner and best friend. We have seen and done a lot and I am thankful for the life we have together. I love you Ian. 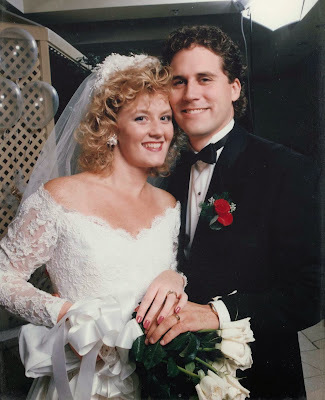 Since tomorrow is our 22nd wedding anniversary so I am posting this blog a day early. Now on to other news. I have been trying to figure out how to write an update on Nomsa and what happened in the TB hospital last week without the blog being totally overwhelming to me or to you the reader. It has taken me a week to think it through and if you are reading this then I have had the courage to finish it. If you don’t know who Nomsa is please go to wednesdayswithnomsa.blogspot.com to find out. Two weeks ago we hired Nomsa to start making rag rugs because she could do them at her home in isolation (not infecting others), and then would have purpose in life and money to buy food etc. It seemed like a great plan and Anthony kindly went to her house to teach her how to make the rugs. One short week later there were no rugs because her hands were hurting and she was having trouble using them properly to tie the cloth on the rugs. Last Saturday she decided to go to church to have people pray for her hands. (Note: she would be using public transport and be in a public place with XDR-TB – Extremely Drug Resistant TB!). By the time she got to church she was shaking and having seizures so someone took her to the TB hospital where she still remains. When she arrived at the hospital she called me and asked me to come visit her. I went the next day with Jimmy and a few men who were on a volunteer trip with Heart for Africa. The nurse said that Nomsa was in Isolation Room #1 and we were not to go in because she is highly infectious. We all had excellent masks on so went in briefly to let her know we were there and to pray with her. We did not stay long and did not remove our masks or get to close to Nomsa or the other patient. She was shaking badly and obviously very sick. We left her and went to visit a few others in the ward. Much to my shock and dismay the 12-year old girl who was discharged from the hospital back in July was back in her bed. This is a long complicated story, but here is the gist. Her father is dead. Her mother got very sick (HIV/AIDS and MDR-TB – Multiple Drug Resistant TB) and the young girl nursed her mother in their tiny one room house until the mother died last November, at home with the young girl. Then the girl herself contracted MDR-TB from looking after her mom (the girl is also HIV positive from birth we believe) and was put in the TB Hospital where she spent eight months on treatment. When it was time for her to be discharged she called ME to come pick her up! Why? Because her family was dead and mine was the only phone number she had. UGH. I could not take her as I have nowhere for her to live, but the nurses contacted her church and made arrangements for her to go live with a family in Mbabane. Fast track a few weeks and she was back at the hospital. Apparently she was pushed by one of the girls at the home where she was staying and she pushed back (who knows what happened? ), but the parents who were caring for her said they would not tolerate that behavior and drove her back to the hospital gate and dropped her off. Two weeks later she was taken back to the family in Mbabane and then it happened again and they dropped her again at the front gate of the hospital. The girl was in a catatonic state when I saw her on Sunday. She is not speaking, not recognizing people and clearly has had a psychotic breakdown. I have spoken with senior people at the hospital to see how we can help and they told me that she is on anti-depressants and drugs for psychosis (which is often caused by the MDR-TB drugs). I am sure the trauma of losing her mother as well as the trauma of living in the hospital and then the trauma of leaving and then getting dropped back was just too much. We have contacted people in authority here in Swaziland who we believe can help. There are meetings happening and we pray that it is not too late. This young girl, not even yet a teenager, can become re-infected just by being in the women’s ward at the hospital. We pray that doesn’t happen. 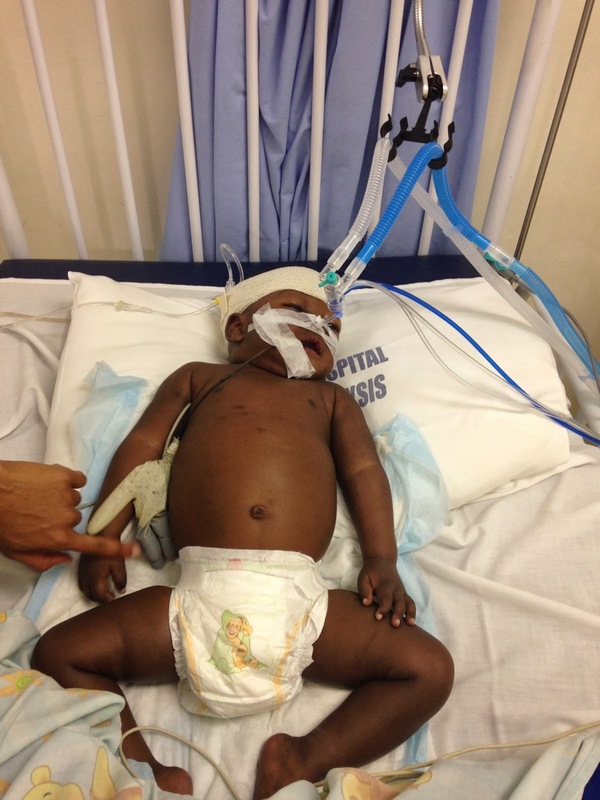 The next person we saw was Baby Abigail’s mother who was back in the hospital after having been discharged. She is totally deaf, but was happy to see us all when we stopped at her bed. She was not able to manage the injections and many drugs at her home and is now back at the hospital getting treatment. I was able to write on a paper and tell her that her baby is doing well. It is all we could do. Now, back to Nomsa. I am told that the shaking and seizures were from a bad internal infection. She seems to be doing a bit better now, but her hearing is almost totally gone (impossible to have a phone conversation and I am not allowed to go visit her in the isolation room). She is calling me many times a day and is confused. From asking me if I have DSTV on my phone to telling me she wants to go home, but she can’t walk. I don’t know if this is the beginning of the end or just another turn in the road. I am trying to reach health care people at the hospital to get information, but have not yet succeeded. At this point we just continue to pray for a miracle. I do believe in those. Tomorrow is our 22nd wedding anniversary and we are going to take the day off. Ian has a fun day planned and I am looking forward to unplugging and enjoying our time together. Live from Swaziland …it's Friday and I am off tomorrow! Labels: 12-year old girl., Nomsa, wedding anniversary.